The New Peoples Democratic Party (PDP) under the leadership of Alhaji Abubakar Kawu Baraje has filed a notice of appeal over last week's ruling by a Federal High Court, Abuja, restraining it from using PDP's logo and colours and recognizing the Alhaji Bamabga Tukur-led National Working Committee (NWC) as the authentic leadership of the party. The notice of appeal was filed this morning by our Team of lawyers led by Raji (SAN) before the Federal High Court, Abuja, presided over by Honourable Justice Evoh Chukwu, who ruled against us last Friday. We are also seeking an injunction and a stay of execution of Honourable Justice Chukwu's ruling. 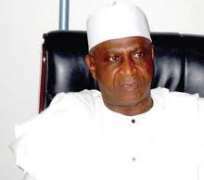 The decision to file the appeal was taken at an emergency meeting of the New PDP National Working Committee (NWC) following the return of the party's National Chairman, Alhaji Abubakar Baraje, from the 2013 pilgrimage to Mecca, Saudi Arabia. The decision was taken after the NWC carefully studied last Friday's ruling by the Federal High Court and after due consultations with our team of lawyers. We once more wish to reiterate that we remain convinced that we have a good case and are thus determined to ensure that Tukur and his cohorts are not allowed to hold sway as the leaders of our great party. Our teeming members and supporters should, therefore, entertain no fears whatsoever and should remain steadfast as we seek to legally establish our case and logically conclude our mission to rescue the PDP from anti-democratic forces so as to restore the noble vision of the party's founding fathers. Finally, due to the busy schedules of our Governors and most of the Stakeholders our proposed G7/Stakeholders/NWC meeting slated for this week will now hold by next week. Venue and time will duly be communicated to members by our National Secretary. One of the major issues slated for discussion is how to receive our new members particularly the five additional PDP Governors who have indicated interest in joining us.